Buildings are a key component to success in Tribal Wars 2 and also show the advancement of you as a player in the game. Each building has a point value, and the sum of all building points is displayed on your city in the map overview. 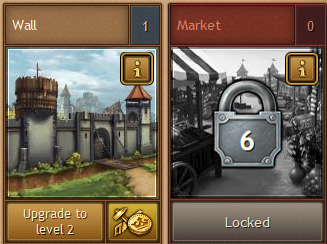 Buildings can unlock features, units and research options in your village. The progression of your village strongly depends on your Headquarter's level, so keep this in mind when planning your building strategy. How do I get more of this? The Headquarters is tied in directly to your building options, as the Headquarters level determines which buildings you may build. In the example below the Headquarters requirements for the Wall have been met (not locked). The Market is still locked as the Headquarters is below level 3. To unlock the Market, you have to upgrade your Headquarters to level 3. This page was last modified on 16 June 2015, at 07:07.